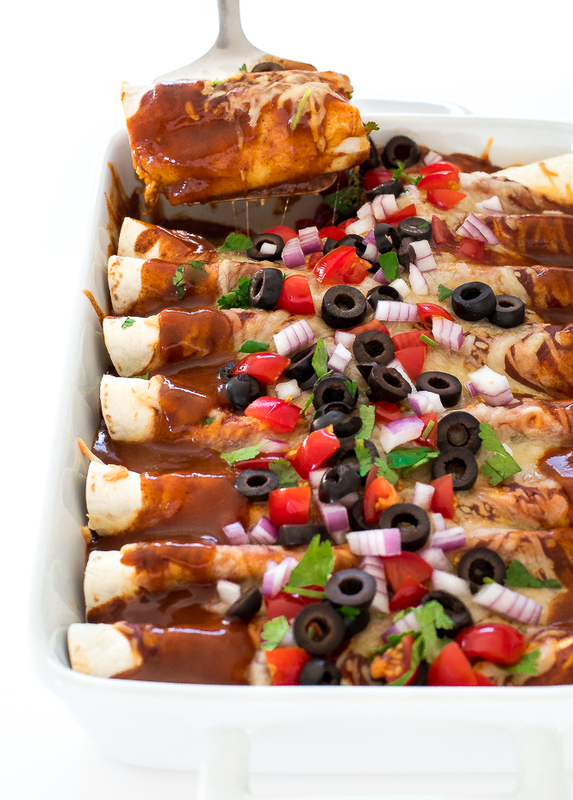 Easy Chicken Enchiladas. Loaded with shredded chicken, black beans, enchilada sauce and shredded Mexican cheese! This is my go to enchilada recipe. It’s super easy to make and they turn out great every time! I use a store bought enchilada sauce to save time but you could always make your own enchilada sauce at home! I stuff the enchiladas with shredded chicken thighs, Mexican cheese, onions, garlic, enchilada sauce and black beans. 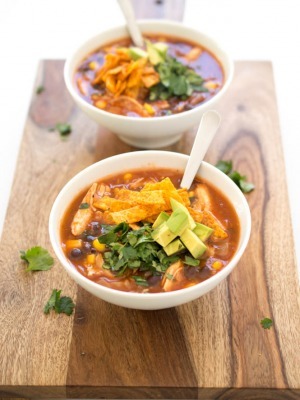 I like to add all of the ingredients to a large bowl and toss them together before portioning it out in the tortillas. I find it easier to assemble this way versus adding each ingredient individually to the tortilla. I love to serve these Enchiladas with sour cream, salsa, cilantro and red onions on top. I also like to serve them with extra enchilada sauce on the side. My Mixed Berry Margaritas, Mexican Kale Salad or my Enchilada Rice would go great with these Easy Chicken Enchiladas! 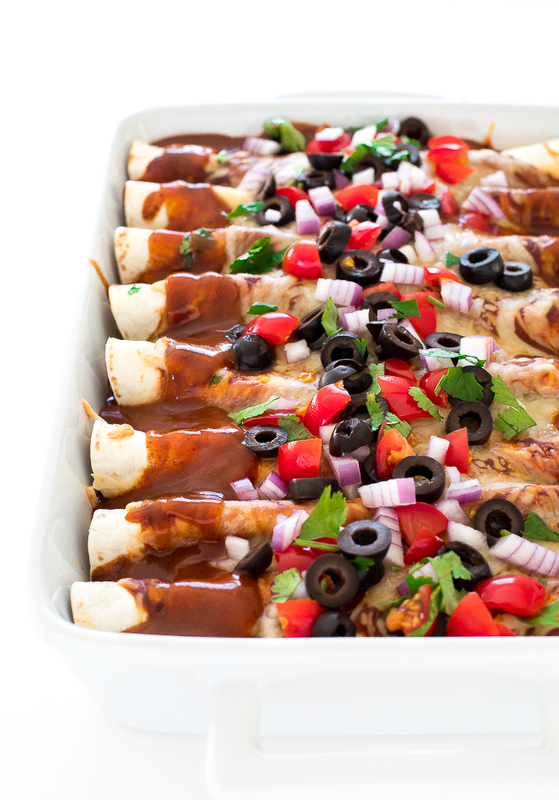 Easy Chicken Enchiladas Easy Chicken Enchiladas. 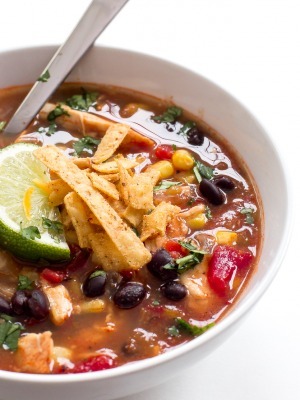 Loaded with shredded chicken, black beans, enchilada sauce and shredded Mexican cheese! Preheat oven to 350 degrees. Spread 1/4 cup of enchilada sauce on the bottom of a 13 x 9 pan, set aside. In a small skillet heat olive oil. Add onion and sauté until golden brown and slightly tender, 3-4 minutes. Transfer onion / garlic mixture to a large bowl along with the shredded chicken, green chilies, black beans, 1 cup of enchilada sauce and 2 cups of Mexican cheese. Stir to combine. Lay out the 8 flour tortillas. Divide the filling between the tortillas. Roll them up and place in the prepared baking dish. Pour the remaining 3/4 of enchilada sauce on top and sprinkle with the remaining shredded cheese. Bake for 20 minutes uncovered or until warm. Serve immediately with fresh cilantro, red onions and tomatoes for serving, if desired. Perfection! I make my own enchilada sauces as well, usually with my own ancho chile paste, although they are made with a variety of dried chile peppers. Why not?!! They’re all so flavorful.